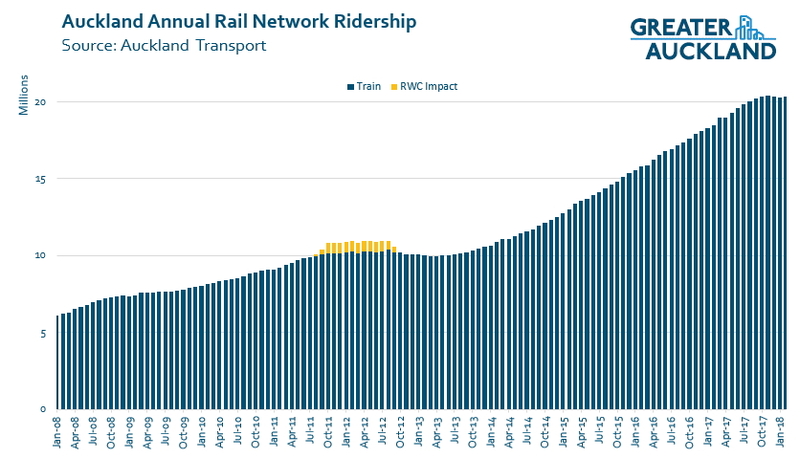 Over the last few years, the growth in the use of the rail network has been astounding to behold. In the four years from mid-2013 to mid-2017 the number of trips on trains doubled to over 20 million. This was primarily as a result of electrifying the system but other improvements such as HOP, integrated fares, new bus networks as well as new and improved stations like Manukau and Panmure have all played a part. Since the end of last year, that dramatic growth has come to a screeching halt. Some of the reasons behind this are explainable, a mix of changes in the number of working days each month, industrial action, network shutdowns etc, but even without those, it’s clear that growth has slowed. Instead of being in the 10-20% range it’s now more likely less than 5%. In the past I’ve looked at a couple of aspects around how we design our train stations that is unfriendly towards users. This includes the lack of shelter and the poor layout at most stations. Another big aspect is how easy it is to access stations. The need to make stations easier to access is agreed by many. Only it’s often said that needs to come in the form of large multi-storey carparks. As we saw last week with the proposed new carpark in Takapuna, that can be incredibly expensive at around $60,000 per space. Based on that, adding 1,000 carparks would cost around $60 million, plus ongoing operational costs. However, with each space only about 2 trips per work day to usage, it won’t make a huge impact on ridership numbers, only adding about 500,000 trips a year (2.5%). That’s a lot of cost for not that much gain. What we’re not doing anything about is making it easier to connect to stations by walking and cycling. We can make the catchments bigger, up to 3km, by making it easier and safer to cycle to stations. Auckland Transport are working on the first two examples at Glen Innes and New Lynn as part of the Urban Cycleway Fund. We can put more people in the catchment by having more housing near stations, this is allowed for in the Unitary Plan. We can make our station catchments more efficient by improving the connections within them, thereby making it easier to walk and/or bike. In this post I want to focus on that last point. To do that, below are a few examples. Newmarket has long been our second busiest station, yet it provides poor access to Northern Newmarket due to only having access to the station at the southern end. For example, from the middle of the platforms it’s about a 400m walk to the Broadway/Khyber Pass intersection. Improving access to northern Newmarket would help make trains more useful to a wider range of people. There have been proposals for a development over the top of the rail junction which could provide access to the station but those all seem to have died. Until such time as a more permanent solution is able to be built, perhaps AT could look into providing a temporary one. One option might be to use temporary materials like scaffolding to build stairs and a walkway into the neighbouring carparking building, which I understand already has access through to Broadway. 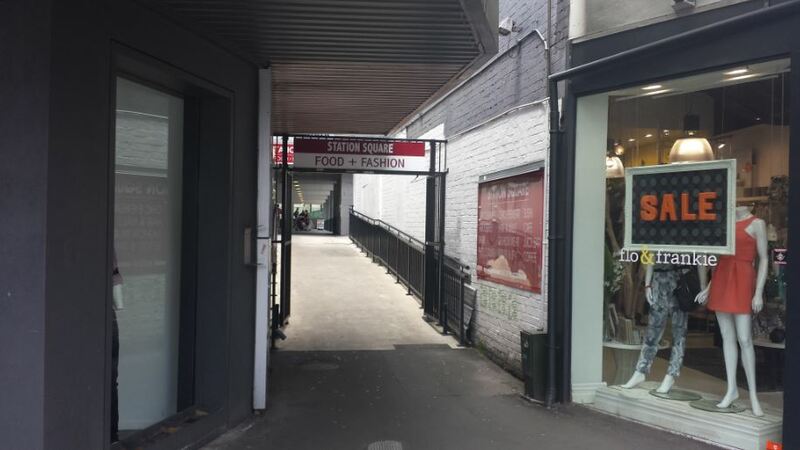 While on the topic of Newmarket, there’s still no news on when the current entry from Broadway will be fixed so it doesn’t feel like you’re walking down a dodgy alley. Just down the tracks we have a much lesser used station in Greenlane. This is not too surprising given much of the closest catchment is the motorway and one of the busiest interchanges in the country. This results in the station effectively being severed from any of its catchment north of Greenlane East. This is highlighted in this map I made some years ago showing how far you can reach with a 500m walk. Fixing access north of the station is fairly difficult but more could be done to connect the houses to the south of the station. There are some houses off Adam St that are just 20m from the platform but would require an 800m walk to reach. Ideally a bridge would be built from the southern end of the platform and provide access to Adam St. Even better would be if a pathway could be extended alongside the tracks at least as far as Mitchelson St. This would help in opening up a lot more houses to have easy access to the rail network. Incidentally, such a bridge used to exist and can be seen in old aerial photos of the station, such as this photo from 1959 before the motorway was built. I’m not sure why it was ever removed. 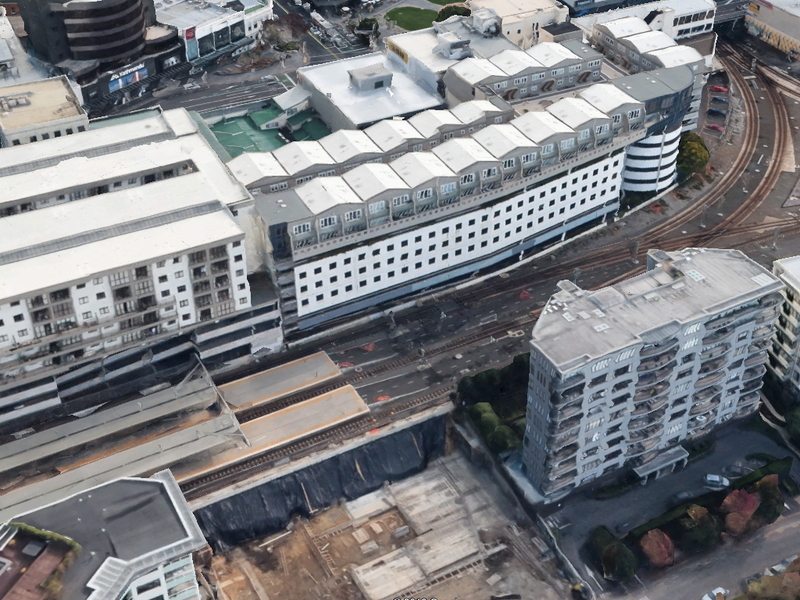 The Sylvia Park station provides good access to the mall but has very poor coverage to the east of the station, including the residential catchment between Carbine and Waipuna Roads. This is highlighted below by some analysis on catchments done by MRCagney for Auckland Transport a few years ago. Harriet has also written more about it here. It’s not just directly at the stations where improved access could make a big difference. In many cases there are links between local roads that would open up greater catchments. One such example is at Ranui where the uncompleted Marinich Dr, I believe due to a dispute with the land owner about who pays for it, where even just a walking/cycling connection would help open up a greater catchment. Examples near other stations often include connections between cul de sacs or other streets. While we need to make a greater effort to connect our existing stations, it’s important that we’re building our new stations with as much access as possible too. We’ve talked a lot in the past about the need to build the Karanga-a-hape Station correctly with the inclusion of the Beresford Square entrance but Aotea needs greater access too. Aotea is expected to become the busiest station on the network but currently it is only planned to have three station entrances. This will be a main entrance on the corner of Wellesley and Mayoral Dr and access from the southern side of Victoria St on either side of the Albert intersection. In our view, this isn’t enough for such a crucial station in the heart of the densest area of the city. At the Wellesley St end, people heading west of Mayoral will have an unnecessary wait compared to if there was a station on the western side. At the other end of the station, people wanting to head north of Victoria will need to exit then wait to cross. Not the most customer friendly. Here are a couple of options for further links from Aotea. The council own the tower on the northwest corner of Wellesley and Mayoral/Albert however I get the feeling that there is a reluctance to integrate it with the station for a fear of the optics it would have. If true, the council need to get over themselves. The council tower even provides the perfect place for an entrance, the large covered plaza area on the western side of the building and linking to Federal St. All that would be needed is a short pedestrian tunnel. At the other end of the station, it would be good to provide better access to the north of Victoria. 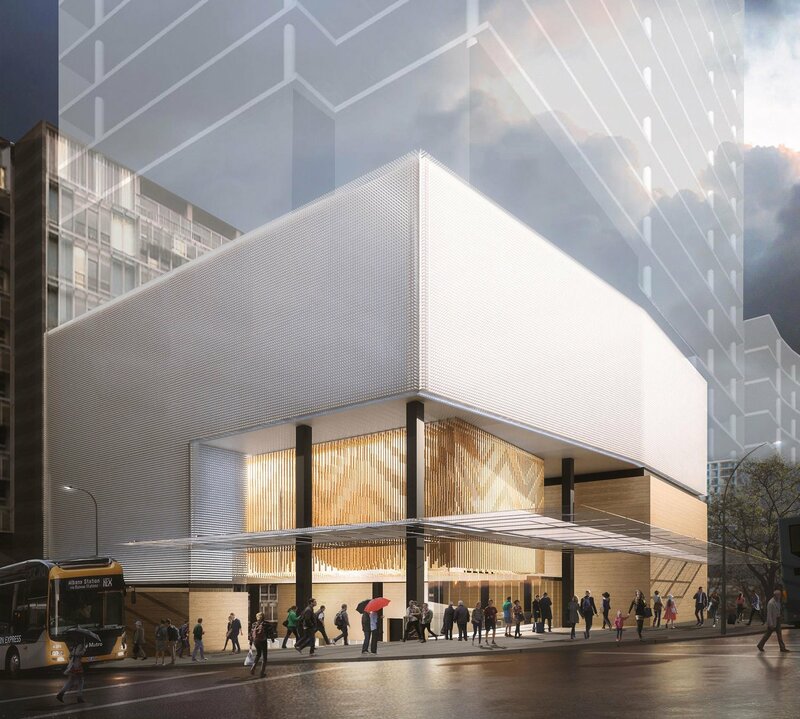 One of the pieces of work needed for the CRL is to shift, block by block, the entire bluestone wall that sits between Victoria St and Wyndham St. The vehicle bridges from Albert St will also go, so too will the toilets accessed from the top of Durham St west. Perhaps the archway could instead be turned into a public entrance to the station. It makes it easier to access the station for many of the people from the north of it. What do you think of some of these ideas and is there a station access you’d fix? I feel like there could be a cheap win to be had with the Newmarket entrance with some proper AT signage; ‘Station Square’ is so generic. Greenlane’s biggest problem is most of that 500m walk is unsheltered in any meaningful way for most directions, which I imagine makes it a hard sell. Ironic really that Glen Innes has such a terrible station when so much work has been put into making it more accessible from both sides of the suburb. Also re: Ranui: All stations should have a Kookie Haus nearby. Bowl both Remuera & Greenlane stations and put one in the middle instead – Somewhere by Otahuri Crescent or Mapau Road with pedestrian ramps over to Lillington road on the other side of the motorway. 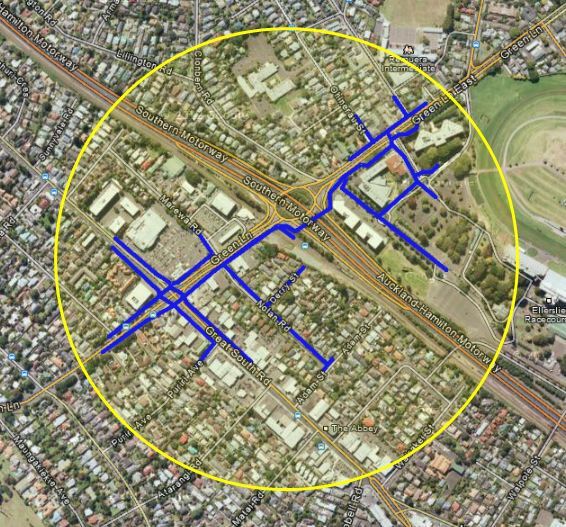 We should be thinking ahead with all the new apartments that will be built onto Alexandra Park, it’s similar walking distance to Showgrounds from existing Greenlane station but you’d be able to access the station from both sides of the motorway a lot easier. Greenlane has a lot of potential being so close to Ellerslie racecourse and the nearby Events Centre and also Ascot Central hospital. I would love to see a separated pedestrian bridge over the Southern Motorway from station to the area, similar to that built at Ellerslie station. The green line on the map is a bridge. https://www.google.com/maps/place/Greenlane,+Auckland/@-36.8890583,174.79625,18z/data=!4m5!3m4!1s0x6d0d489dc424cf03:0x500ef6143a2c840!8m2!3d-36.8916294!4d174.7924371 I haven’t used it, but you can see it on streetview. They’ll never repair the area properly, but the minimum start would be to have four interconnected paths: one more over the motorway and two over Greenlane Rd. All close to the roundabout. And traffic signal priority changed as noted by others here. I see now. The bridge certainly looks convenient for connecting from Greenlane West to East. My suggestion was perhaps including a shelter. It still doesn’t make it easy to connect to the Clonbern Road side of Green Lane East. The only suitable pedestrian crossing is at the lights at Ellerslie Racecourse Drive. Getting across Green Lane West is also a challenge. I am confused as to why the area west of the station is a used cars salesyard. Seems like the most inconvenient location to have it, both for the business itself and for anyone using the train. Aha we can reimagine the city without car yards and it is a prettier thing. 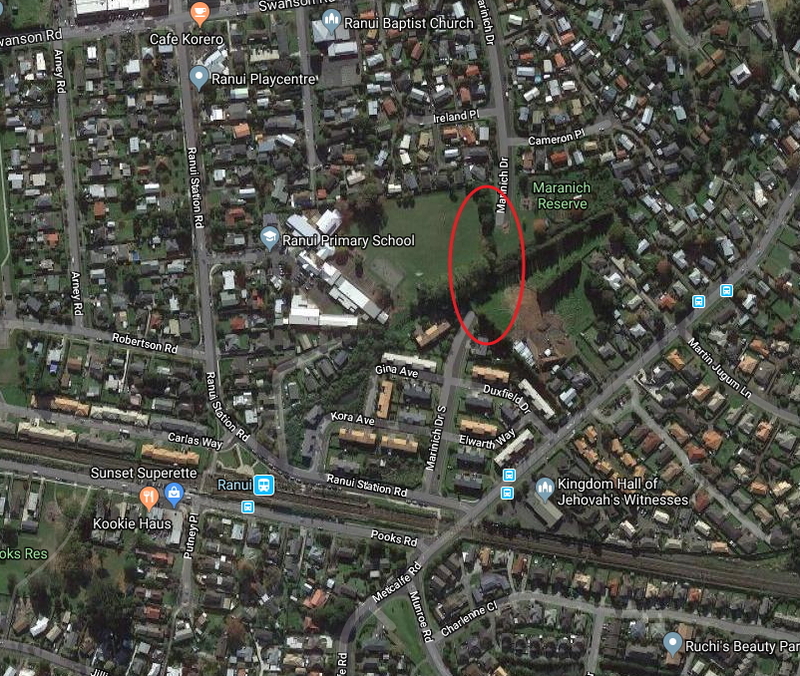 Pedestrians could walk from new station along existing Aratonga Ave or Momona Rd towards the showgrounds via an underpass that goes under the Puriri Dr grounds and pop out right outside the showgrounds. At the same time it could allow people coming in from Remuera Rd to just walk down Armadale Rd or whatever and walk over the motorway along a pedestrian footbridge past the station. IMO that would give some people a few more options instead of having to travel through Greenlane roundabout. I’d like to see Lillington Rd become more intensified for 3-5 storey buildings. Narrow strip of land running adjacent to the motorway could be better utilised. Lillington Rd & Clonbern Rd would also be the main route that pedestrians would use to travel to Ellerslie racecourse – Much more pleasant to walk along tree lined ways than to walk amongst car fumes. Could we add Glen Eden to the list of abysmally poor stations? Because no one had the balls to take on Wilson parking, getting to and from the park in ride carpark involves parking your car next door to a soon to be ten story high, 168 apartment block of slums (which doesn’t fill you with confidence your car will still be there and fully intact when you get back) walking down a poorly lit Waikumete road (see comments on slum housing) that (at the moment) has no footpath and crossing two roads, one of them quite busy. If you decide it would be nice to pop into the Fresh Choice supermarket you have to cross the insanely badly designed West Coast road either by walking in the opposite direction to the supermarket to the controlled crossing at the intersection at Glenview road or simply doing what everyone does and jaywalking around the Captain Scott road intersection. Heading back from the supermarket to your car at the park and ride requires another awkward double crossing of West Coast Road and Glenview road. It has to be amongst the worst stations in Auckland. The Pukekohe station is (literally) in a hole. Pedestrian access to the surrounding streets leaves much to be desired. Even then, the station is some distance from the centre of Pukekohe. Which is why I prefer to get the bus from Papakura to Pukekohe, even though I get to Papakura by train (from West Auckland). What I’d really like to know is why the fenced off the carpark between the pedestrian bridge and the Warehouse. It’s absurd. It is due to the fact that carpark is privately owned. The majority of stations remain invisible on the network due to poor wayfinding signage within the 500 metre radius. What little signage is there, is too small in size to be seen from a distance and often is in the wrong position. Auckland should follow Hong Kong in having signage in the 500 metre zone that is visible (seen easily in daylight and at night) and can be read by people with any degree of visual impairment. Legibility of station perimeter signage is crucial to building service patronage and in Auckland, universal design must take priority over graphic design. Auckland council appear to be trying to extend the poor visibility to the new street sign designs as well. All that was required was to choose the colour moving forward and leave the size and lettering unchanged. The new signs are hideous and should never have made it past testing in the first place. Almost impossible to read in the day and even worse at night. Heidi I don’t think it was very attractive prior to the motorway. Somebody had built an ugly great railway line through the middle of it. A testament to humankind’s ability to pour concrete Heidi. I fail the slump test every time I look at areas like this. Signalised intersections adjacent to stations are another impediment to easy access, particularly when you need to cross on two cycles and have significantly lower priority than motorised vehicles. Another issue is the layout of the stations themselves. At Avondale station passengers going toward the city when approaching from the northern half of the catchment are required to approach the platform via an extended U-shaped path that adds around 75m to the journey. I understand this is a legacy of Joyce’s first tranche of cuts to PT capital expenditure in 2009, which saw a proposed pedestrian over bridge eliminated. Soon you will have to include the lack of access to Beresford St. It won’t be cheaper to build it later. 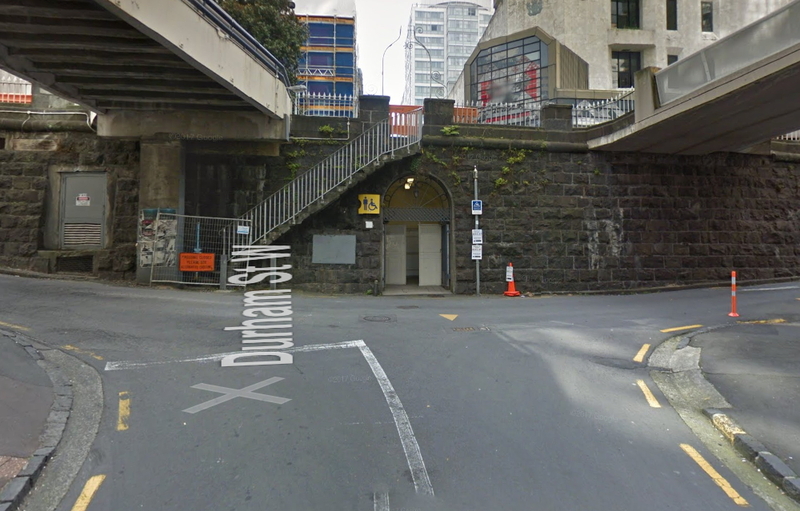 I like the idea of an entrance through the Durham St toilets, but I’d suggest that keeping the bluestone entrance and removing the toilets instead, or even rebuild new toilets inside the entrance. Yeah having an entrance through the arch in the bluestone wall would be great. I think that’s what Matt was suggesting. There would need to be decent cycle storage in each station, ie covered and monitored by security in order to make leaving a bike there more reasonable. Otherwise carriages will be filled with people and their bikes, which while not a bad thing, at peak times they would take up way too much room. I think selling the development space above the stations on all the lines, with a caveat that connectivity of the station must be improved with any development would lead to better outcomes on the rail lines. Currently every station feels like a country station with very little cover from the elements. If they could be covered with a building and developed with more commercial outcomes in mind they could become stronger parts of the community. New Lynn is currently the closest station to doing this. But every station could do this. i live in Wellington and find it crazy as a cyclist I have to pay to store my bike in a bike locker whilst the station is surrounded by vast swathes of ‘free’ park and ride. 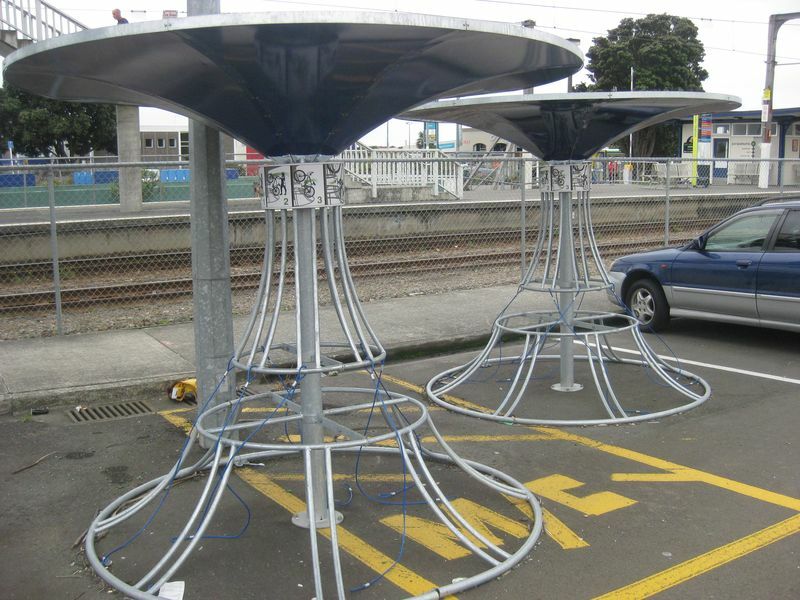 But Luke, many if not most of Wellington suburban stations provide free bicycle storage racks in the form of those round, mushroom-shaped structures https://wellingtoncycleways.files.wordpress.com/2013/08/bike-racks.jpg , but of course these do not provide the security that lockers do. You don’t see many people using them for obvious reasons, but they are the cyclists’ equivalent of free, non-secure park-and-ride. Only a few key stations provide secure bike storage and I think it is fair to pay a (small) fee for this. The policy of providing free (i.e. highly subsidised) park-and-rides for a relatively small proportion of rail passengers is a separate issue and remains an inefficient use of funds and resources whatever provision is made for bikes. But yeah – I can see why you might object to paying for a bike locker against this backdrop. I ride to Sunnyvale station, but wouldn’t dare leave my bike chained up there during the day (I like my wheels and saddle), so in order to not take up too much room on the train at peak time I got a folding bike, which works well. It would be nice to have the option for safe dry storage for my full sized bike though, and I know people who would ride to the station rather than drive if this was the case. There’s actually a good shared path servicing this station from two directions, which is a really pleasant ride but not very well connected and signposted, so doesn’t seem to get that much use. A shame really. The northern busway has some decent cycle storage, clocked and covered. Plenty of the land around these stations could provide more housing and mixed use to replace carparks. “We can put more people in the catchment by having more housing near stations, this is allowed for in the Unitary Plan.” Yes, but if we look at the privately owned carparks near Greenlane Station, for example. I would doubt that the owners there will take any hint from the AUP that they need to make better use of their carparks. We need to tax land used for carparks, too. Perhaps in the locations of the stations, land used for carparks should have a targeted rate to help pay for better access to the stations. All parking (public and private, on-street and off-street) should be taxed, perhaps $1 per hour, 24/7, to both discourage car use and to help pay for public transport. There is no way McDonalds or Progressive will ever give up those sites, they fought very hard to get them as they are prime spots. McDonalds bought out an entire chain to get that spot. 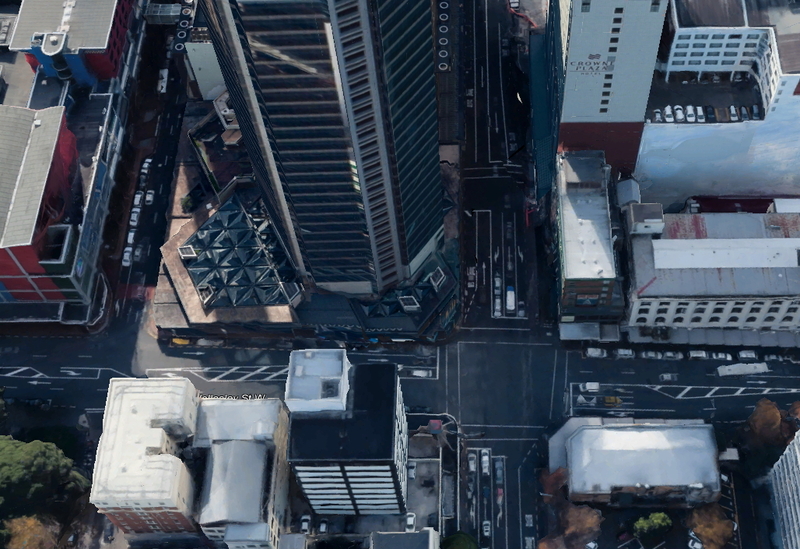 I agree, things can change but I can’t see that intersection being at the forefront of Auckland’s transformation! Either way McDonalds and Progressive will probably never sell that land purely to ensure it never falls into the hands of their competitors such as Foodstuffs. I’m pissed off they are closing the level crossing at Papatoetoe and making me walk an extra 200m up and down stairs. Even worse if I am carrying a bike up and down stairs. It is enough to put me off taking the train and just driving most the way to the city and cycling in. Convenience is a huge factor in determining what mode I use and some changes they make just make things worse. Interesting that you highlight the Greenlane Station – Albert-Eden Local Board has been discussing this very issue for some time and is having an on-site meeting next week to discuss improvements to way-finding signs in the short term and possible improvements to access in the long term. We have already voted money for the errection of a beacon to highlight the entrance. We hope to coordinate our efforts with our colleagues from the Orakei Local Board on the other side of the rail line which forms our boundary who are also interested in the issue. Thanks Graeme. Cycle storage infrastructure might be good to add into the plan at this stage. It can start small and grow, perhaps with a plan for how to decide when to add more. This links well with your article on traffic light phasing last week. The intersection of EP Highway and Forge Way has an insanely long cycle, especially if you are wary of how close the next train is. It also has something I have never understood, if you press the beg button 1 sec before the ped cycle is due it is ‘too late’ and you have to wait for the next cycle. I hate that so much. I understand not triggering it if you are a second too late for the green, but I truly loathe the cycles that demand that a pedestrian be there 2s early. Yes it’s like “can’t have peds looking like they get fast prompt priority” or something. I’m also intrigued by this [incredibly frustrating] behaviour. The closest I’ve come to rationalising is that once the preceding orange phase is running the lights have already ‘locked in’ whatever is next. If so, then why this is required I do not know. Perhaps a carryover from when they were mechanical switches with preset patterns? Or that in the era of advanced real-time computing we have been sold a fairly crappy solution by the Aussies? Worth noting that it is not just pedestrians- any phase that can be skipped, such as right green arrows, also exhibit this laggy response. Agree. Can any experts here shed some *light* on it? I think it is just a setting, literally the next set of lights down the road there appears to be no lag at all. I concur, it’s a setting. Someone has made the decision that any pedestrians arriving in that period don’t deserve to go. Right filter arrows don’t do this, but they do take a little while to check that a car actually is there. So a quick letter to AT would have it fixed pronto, I imagine? @Sailor Boy – are you sure about the right filters behaving differently? There are lights near me where they only give right green if you are over the sensor before the preceding amber phase (even by half a second). These are turn signals that are only at the start of the main green, not at the end. Unless this is semantics, that the car ‘check time’ is the same length as the amber phase? This is also an issue at Sylvia Park since they replaced the pedestrian crossing that worked perfectly for prioritising passengers and replaced it with a set of lights. 2. Extend the footbridge over the road. The vast majority or passengers are going to/from the mall, so why was it designed to leave them on the wrong side of the road? I often wondered about the lack of safe crossing from the station to the mall, especially given that Kiwi Properties built the station as part of the mall construction. Was it simply the fac that they were forced to include the station as part of the mall and therefore built it as cheap as possible. Surely extending the footbridge over the road wouldn’t be that expensive, although if they had to add a lift in as well that would increase the price. 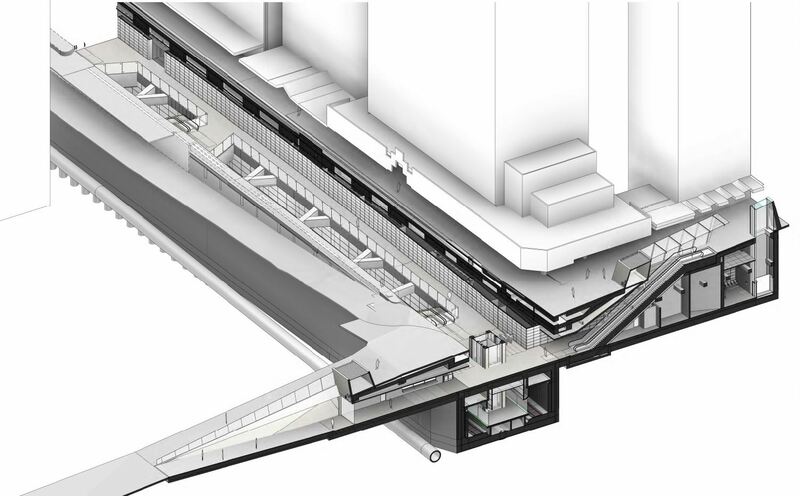 +1, you would think that they would include a concourse above ground all the way to the mall and stairs inside! Greenlane could really benefit from a few things, access from the southern end via a covered bridge and walkway. A cover for the northern access would also be great. 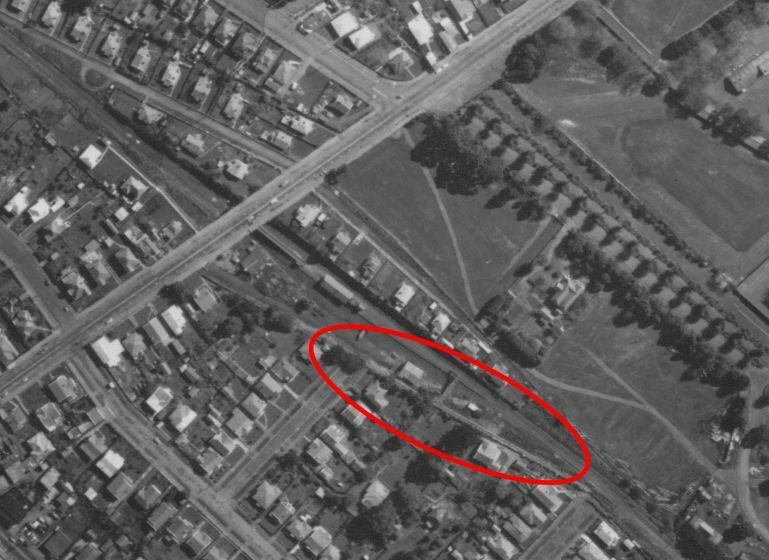 I say bowl both of the existing Remuera & Greenlane stations and put one in the middle instead – Somewhere by Otahuri Crescent or Mapau Road with pedestrian ramps over to Lillington road on the other side of the motorway. There is also one less station for Southern line trains to have to stop at. Both Remuera and Greenlane stations offer better bus connections than the location you’ve suggested, though, which wouldn’t ever have good bus connections. Or do you have a solution to that? These areas should become densely populated areas (although whether the AUP can deliver this remains to be seen) so I would have thought keeping both stations was pretty important. I disagree on the bus connection part, a new station would use the exact same bus services that already go up and down along Great South Road, it’s heavily serviced already. If a new train station was put on either of those side streets (Whether Otahuri Cres, Sunnyvale Rd or Mapau Rd) there would already be sufficient bus connections to link up elsewhere. Could I perhaps email or PM you directly with some ideas, however ludicrous they may seem? It’s more the crosstown bus connections that are important here, there won’t be many transferring to parallel buses on Gt Sth Rd. Green Lane was to have a frequent crosstown route in the new network, however it was downgraded to 30 mins off peak. I’d expect it will become frequent at some point in the future though. I do agree though from a pure residential catchment perspective you suggestion is probably a bit better than the current location. Your plan places a bit much reliance on walking through subways though, this is a risk to these connections becoming popular, especially if one leg of the journey is at night. Sounds good in lots of ways. But agree with Jezza re underpasses and safety, though perhaps this could just be opened for when events are on at the grounds or during the day only…don’t think is something ever done though anywhere? @Jezza – Yes that crosstown route won’t even run in the evenings (weekday or weekend) unless it’s changed, which seems really poor. I only suggested underpass by Puriri Rd green space because there would be more objection to an overbridge or a pathway cutting across the greenspace than an underpass. I do get it though, would look rather dodgy at night time. Agree about Lillington and Clonbern being prime for development. And a station in that location would be great from a local catchment point of view. But yes, as Jezza says, it’s the crosstown routes that it would miss. I think eventually, when AT gets [insert preferred expression], there will be excellent connection for both east and west at Greenlane and Remuera, with crosstown buses for the former, and feeder buses along Market Rd for the latter. For the cross-town – Isn’t there enough access already at Manukau Rd from Newmarket, Balmoral Rd and a bit further South at Penrose? I know there’s a 71 or 73 bus or whatever that goes from Sylvia Park, stops outside Penrose train station along Gt Sth Rd and heads towards New Lynn. That would mean stay on the train and get off at Penrose or Newmarket instead of Greenlane if you wanted to go cross-town. Not much use for getting to an appointment at Greenlane clinics, to the retirement village at the Showgrounds or meet someone for lunch at Cornwall Park. While the Green Lane – Balmoral Rd corridor is a bit of a traffic sewer it is a very good crosstown route, with no major dog legs and has a lot of potential for crosstown buses now we have integrated ticketing. Crosstowns can be worked out a number of ways, I guess. I think the main thrust of your proposal is to try to create a walkable city where possible, by allowing pedestrians routes away from foul car-ruined landscapes. I can see the merit in this. The better goal eventually I think is to repair the car-ruined landscapes by removing traffic lanes and increasing flow of people with rapid transit. Designed well this assists in the walkability too. From an equity point of view, I think we need to think about where money is best spent to provide more modal options for more people without good access, and in a way that helps establish a RT network rather than adds cars to the road network. This area has some foul car-ruined landscapes, that’s for sure. It also has better PT than most areas. It would take a lot to convince me that a new station here is good value for money compared to other improvements elsewhere. But that’s just me – why don’t you write up a post and see what others think? Interesting idea, but yeah nah. Remuera Station also looks like has some historic like aspect to it. I’ve actually still to use this station, about the only one I haven’t. Remuera can be kept for heritage purposes. Papatoetoe did the same with it’s old station, moved a few hundred metres up the road and now it’s a tea room/community use facility. I wholeheartedly agree about Greenlane having potential. It has reasonable access to the GSR bus route and could have good connections with the 007 as it goes right past it. The motorway underpass/overpass is dismal. Re-establishing a connection to Derry St would be an easy way to start. Providing more attractive access over the motorway would be good. In wonder if a connection to the north-western side of Greenlane Rd could be achieved with a path beside the tracks under the overbridge, coming up by the car wash place would be possible. Re: Newmarket northern access to junction of Khyber Pass and Broadway: a station at Kingdon Street would achieve this, as was done with the temporary station constructed there for the 2010 upgrade of Nmkt station itself. That Kingdon St station was pretty substantial. The CRL may deliver some kind of route that would justify reinstating the station there. The CRL running patterns wouldn’t benefit from an extra station at Kingdon St, with the existing Newmarket and Grafton stations being so close it wouldn’t make sense to have an extra stop. Those long winding ramps at Penrose and Puhnui, are a challenge. More path connections could be made at Meadowbank. Otahuhu station requires a long walk from the lights at station Rd. Opening platform 1 would make the long climb necessary half the time. We need more shorter, easier and cheaper underpasses like at Ellerslie and Morningside. Sylvia Park has a timetable inside the Mall. More of these outside the other stations would be very helpful too. I find penrose annoying. I accept the need to cater for wheelchairs but to travel a distance of maybe 20 metres I have to walk around 400! Ludicrous. Having Penrose as he transfer point between the Southern and Onehunga line, especially given that ridiculous long ramp, seems to me to be silly. Whenever I’ve needed to transfer between the two lines I always go to Ellerslie where you step off on one side of the platform and simply walk to the other side. Maybe AT can consider add announcements to their trains to suggested people change at Ellerslie rather than Penrose. I’m inclined to think by the time someone walk from Penrose 1 or 2 to Penrose 3 they could have continued to Ellerslie changed trains and come back. That’s a good tip. I’ll have to keep that in mind. Catching the bus from Penrose to Onehunga was more of a miss the couple times I tried it. Once from the Southern, once due to a service fault. In my mind they should drop Penrose from the Southern Line entirely, just have it on the Onehunga. Recreate Southdown, and move Penrose 3 closer to Mt Smart Stadium. Could work. Not a bad idea. World adding to the EWL redesign consideration. Or 3rd/4th Main work. Great post, yes, agree with them all. Greenlane could be vastly improved, such a waste of a station currently. Remuera could perhaps have an underpass directly to Mt Hobson Rd and/or a long walk/cyclepath north along the rail line to link with the ped overpass to Dilworth Ave. I could only see a saving when walking from Britomart Plc to QE Square, the issue being that the route is via the platform. Are you suggesting they built a route that runs parallel to the platforms or that there is a route that allows access to the platforms without a card or ticket? What I believe he was suggesting was a walk from the Queen Street end of the platforms to the Takutai Square end without having to tag on/off at each end so you could use it as an underground route to avoid getting wet. Which is a sensible thing to do, however the fact that there is no non-passenger route means that tagging on/off must occur. I don’t think that it would be reasonable to create a new thoroughfare for non-passengers, since the ownership and use of a HOP card is not onerous – Well, may change if it gets replaced with that Wellington (probable) garbage. Before the introduction of the gates it was dry convenient to pop down to the platforms and come up at the other end on a wet day. It is free. You have to swipe a card, but if you tag in at one end and tag out at the other shortly after you aren’t charged. Note at Flinders there is only one concourse you can cross without swiping in. If you want to walk along the platforms you need to go through the gates. I hadn’t realised just how ugly the buildings are in Newmarket. Did they get some former East German architect to draw they up? Or did they just ask a civil engineer to do some plans? I had. Although I must say they look even worse from the air, which I didn’t think was possible. Presumably a traffic engineer designed them, given they are little more than an afterthought built on top of a parking garage. Not sure of the style. I think it’s Constructivism, but missing the Cubist influence that is the only saving grace of that style. Perhaps an architect can weigh in? It might have been worse I suppose they could have gotten a certain architectural Knight from Christchurch to do it in his trademark brutalist style. Of course, even better would be to have nice looking buildings that fit the character (or aspirations) or the area. Though If I had my way, I’d build everything as Art Deco or Streamline Moderne, just because. As long as the buildings are nice inside and are well insulated I guess. I posted a tweet about Sylvia Park Road last week while on my way to see Twyford at the PBA. Not a very easy station if you have a bike. Sylvia Park station was basically paid for by the mall developers. Frankly, they’re interested in delivering shoppers to the mall. They’re not interested in providing better access to the station from anywhere else in the 800 metre catchment because those locals will use it for commuting to other destinations. The likelihood of more business if you increase amenity for even commuters is high. That also not including the likely change to the mall model with additional of offices, etc. Then you need to providing faculties for commuters. Allows you to add $ psqm to your office rents. Failed business logic suggesting that allowing business to decide these things in NZ is silly. Business here is conservative. Planning needs to be aspirational. The station is at the mall. Improving access to the station would also improve access to the mall. Do you guys think Sylvia Park could be turned into another Britomart style hub if SE highway and Eastern train line were integrated with the upstairs part of the mall behind Hoyts? I made up some doodles last year of a possible type of integrated transport hub on a previous post on this blog – If you search ‘LGOIMA’ on this blog and find one of the posts by Harriett, there I uploaded some ugly MSpaint pics, I reckon Sylvia Park has so much more potential than currently exists. I mentioned on this site, a couple of years ago, that there used to be at Newmarket station a pedestrian subway, running from the city end of the platform to about where the Rialto entrance now is. I wonder if at least a part of it may remain, and be usable as part of a new subway ? No the subway went to the workshops on the eastern side of the station. Sold off aeons ago, one of the first Fay Richwhite asset sales. K’Rd has to be the worst. One entrance only, on a steep side street. It could easily have a horizontal entrance from Myers park, along with Beresford. Overseas normal practice for a station under a road would be 4 entrances, one each side of the road, at each end of the platform. Double that for an intersection. Less busy entrances can just have stairs, more busy escalator up and stairs down, and busiest escalators up and down. I don’t know what council are doing, but clearly not focusing on the basics. Too many managers, lawyers & media consultants? I agree although it wouldn’t be horizontal from Myers Park, it would still be 25m below park level at that end. However, the station would be level with Beresford Street Central in Freemans Bay, which is very interesting. Great idea. Drill a tunnel from St Kevin’s arcade (on the north side of Karangahape Rd) under K Rd to the Mercury Lane station and bingo, a new portal in the arcade. Agree. Every subway Ive used has many entrances which can be confusing but provide easy access to street level without crossing traffic. Why not k road to Queen street with side exit to myers park. Beresford is a no brainer but more useful if exit on other side of Pitt Street as most people will still need to cross road. I can see people getting off at k road on the way to city (down hill walk) then using Aotea for trip home. Henderson – keeping the pedestrian overbridge connecting residential to retail open when trains not running. This access was closed for over 2 weeks at Xmas rail stand down. That sounds like a decision made without understanding users’ points of view! One thing I thought about when I saw the finished New Lynn Trench station was how a car parking building could be built above at least one of the trenches (or park-andride commuters). How convenient would that be? Or maybe a major bus terminus. Looking at the link there is a proposal for a sound wall B1 which subject to funding near Greenlane Station The original proposal is that the wall is on KiwiRail land and adjoins the residential properties. (might have changed with the survey of the land) To build such a wall in this location an access road will obviously be required which ideally could be a pathway location after construction.Looking at Google Maps there appears to be enough land between the rail and the boundary. My suggestion at the public display was to incorporate a cycle/walkway next to the wall between Greenlane and Ellerslie. This path could join all the streets such as Derry,Adam,Woodbine,Walpole and Hudson. The obvious Bridge crossing is at the southern end of the Greenlane Platform towards Adam Street with a path northwards to Derry street. This siginicantly increases the amount of potential passengers within 800m. However I am with others proposing Greenlane station is moved northwards and closing Remuera. Just look at the Unitary plan and look where the proposed high density centre is. Remuera Station is at the north Greenlane Station is at the south. Not my view however I have heard that some especially woman do not like Greenlane Station as it is down in a hole,noisy due to the motorway and very isolated especially at night. These issues are not going away. Back in the ‘70s Greenlane station was to be closed, I seem to remember that it was actually closed for a while, as part of a grand scheme to integrate bus and rail at major stations. It was later decided that the station was to survive because of the potential catchment and because the bus integration near happened. As part of Robbies Rapid Rail there were plans for intergrated bus-train transfer stations next to the motorway, there are some sketches kicking about the internet somewhere. Pretty sure Greenlane was one of the interchanges, which makes sense because of the fact it connects to Greenlane and Balmoral Road as a long crosstown route. They were good plans, dedicated bus lanes on the motorway overbridge with covered in bus stops on both sides, and ramps down to the train station from both sides so you could make all transfers without crossing the street. According to http://railheritage.org.nz/assets/Dates_and_names.pdf, Greenlane closed in 1987 (though I thought it was earlier than that) and reopened in 1993 or 1994 – that would have been in conjunction with the introduction of the ex-Perth DMUs. Presumably the footbridge at the south end was removed after the closure. Please have pedestrian crossings on both ends of the platforms please. It is quite dumb you have to go to the far end of station to cross. Similarly parnell also has the same issue. Kelvin I’m a bit confused as the the problem with the layout of Avondale station. There are two pedestrian crossings at each end, one near the Crayford Street East & West ends and one adjacent to St Jude Street. As far as I’m concerned they would be the only places passengers would come from to access the platform on the opposite site. The crossing near Crayford st is at 9 Layard St, which is north of it. If I wish to cross from the middle, I will have to go either end, which is quite far either way. The detour is roughly 120 metres (in total), not a great distance. I don’t think you could possibly put the crossings any closer to the platforms. This is in itself a great ‘side project’ for unlocking growth within the existing network – as catchment is everything. The trains aren’t quite long-enough for double-ended stations at many locations, but where easy, it should be a rolling undertaking, a little like the level crossings should be. In some cases, it’s a shortcut or a footbridge – in others, it is about visibility or PR. Maybe secure bike parking, better access to schools, shops or nightlife – and other off peak usage types. Perhaps allowing more densification or encouraging retail/hospitality next to the railway. Parnell here is criminal, and should not be considered ‘done’ at all. Nor should K Road and Aotea – and indeed eastern Britomart and The Strand. All of these could be offering more – and with gatelines. Smaller suburban stations with an additional exit don’t matter too much to farebox as most will be exiting somewhere with gates.